Silver Oak Learning K-12 > Blog > Is the ACT Really Easier than the SAT? I am asked this all the time, so I figured with all the interest now would be a good time to talk about it. The short answer: no. The longer answer: It depends. The ACT built this reputation of being easier by being based less on the analogical reasoning of the SAT and more on content knowledge. It aimed to be a truly summative assessment for high school learning, while the SAT originally aimed to be an aptitude test, and later shifted gears (or at least names) to become a reasoning test. All of this is to say that the ACT came across as being a much more “straightforward” test, one without the obfuscation of arcane vocabulary and logic problems. With this in mind, it is easy to see why it was a “better” test for students who performed well in school but were not quite used to the format of SAT problems. 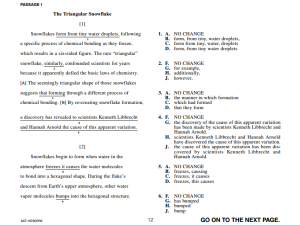 College Board took a notice of these complaints when creating the Redesigned SAT. In fact, it looks suspiciously similar to the ACT. Surely CollegeBoard noticed headlines like “Why ACT overtook SAT as top college entrance exam” and reacted as expected: by trying to beat their competition. Still unsure? Take a closer look at the sample tests provided by ACT and CollegeBoard. Differences still remain—The SAT, though it further emphasizes Science, still does not have an explicit Science section—but the two look more alike than ever. And with the most recent changes made to the ACT, a new essay, new grading metrics, and the addition of paired passages to the Reading test, it too is closing the gap between the two tests. So…is it easier or not? The SAT gives you more time per question. Over the whole test, the SAT gives you about 70 seconds per question; the ACT gives you roughly 50 seconds per question. The SAT is effectively giving you the same amount of time as the ACT to complete ~72% as much content. This time difference can be huge. The SAT has longer, more complicated word problems. The ACT math section is still more “straightforward” than the SAT one. The SAT has some word problems that are dozens of words long. The ACT test more math topics. The ACT has 1-2 questions in many different math topics; The SAT, on the other hand, requires you to know a few topics, especially Algebra and Data Analysis, very well. The ACT has a Science Section. And for many students, it’s the toughest part of the test. If you are not used to reading about experiments and drawing conclusions from them, then you probably want to avoid this part of the test. SAT Reading questions are in order of the passage. 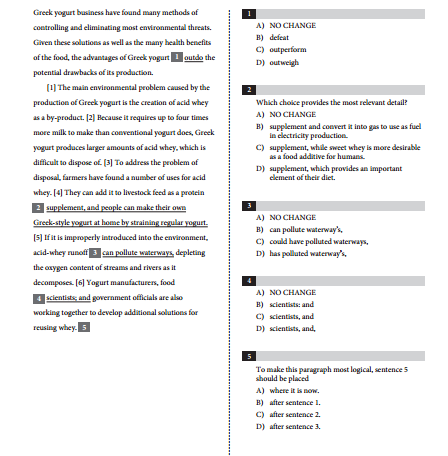 The ACT Reading section is scrambled, with no logic to the order of the questions. This means that strategies for handling the Reading section on each test vary. Both tests are standardized. This means that, at the end of the day, a student’s score only means something when compared to those of other students. If one test truly were (or is) easier than the other, then the curve of the test would be more punishing, nullifying the difference. Whichever one you can stand looking at for a few months straight as you prepare for it. The most important factor to consider when making your decision is which one will you wholly commit to. The beginning of this article has links to sample tests from each company, so try them out and see which you like better; alternatively, schedule a free assessment at our center and one of us will gladly explain what you need to work on. Feel free to forward any questions you have to clinton@silveroaklc.com.